Ranunculus is a large genus of about 600 species of plants in the Ranunculaceae family. Members of the genus include the buttercups, spearworts, and water crowfoots. The petals are often highly lustrous, especially in yellow species. Buttercups usually flower in the spring, but flowers may be found throughout the summer, especially where the plants are growing as opportunistic colonisers, as in the case of garden weeds. The water crowfoots (Ranunculus subgenus Batrachium), which grow in still or running water, are sometimes treated in a separate genus Batrachium (from Greek βάτραχος batrachos, "frog"). They have two different leaf types, thread-like leaves underwater and broader floating leaves. In some species, such as R. aquatilis, a third, intermediate leaf type occurs. Ranunculus species are used as food plants by the larvae of some Lepidoptera species including Hebrew Character and small angle shades. Some species are popular ornamental flowers in horticulture, with many cultivars selected for large and brightly coloured flowers. 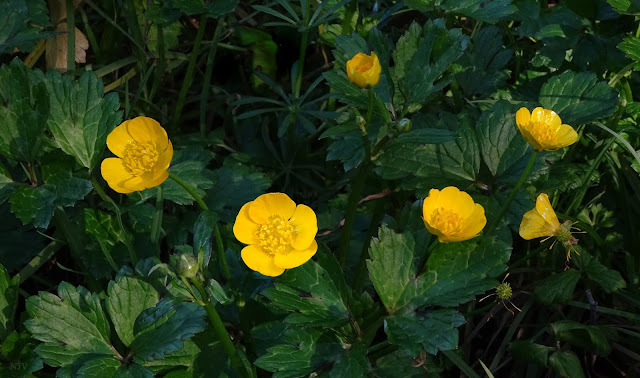 Ranunculus repens, the creeping buttercup shown here, is a flowering plant in the buttercup family Ranunculaceae, native to Europe, Asia and northwestern Africa, The flowers are bright golden yellow, 2–3 cm diameter, usually with five petals, and the flower stem is finely grooved.